When I obtained this very interesting looking spoon, I suspected that it was used for serving a specialty item, but I didn't even know that there was a specialty server called a "croquette server". Osterberg's book, "Sterling Silver Flatware" however shows an item labeled in this manner and says that it is for specialty French cooking which is held together by a thick sauce and then deep fried. I suspect that this spoon could also be used as a large bonbon server. 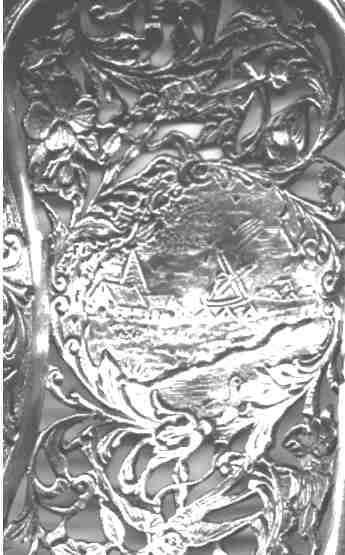 Server measures 8.3" and bears Dutch silver 830 hallmarks and also bears retailer hallmarks (which I suspect are American or Canadian , but I haven't been able to trace them--part of this mark looks suspiciously close to the Durgin trademark). I suspect that this piece was manufactured in the 1880's. I particularly like the rather unique nice art nuevo (aesthetic) curved shape of the bowl. 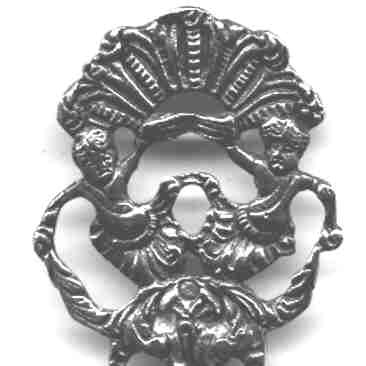 The mid section of the handle has two birds. This was a popular motif for use at weddings. The bowl has a solid section in the center which has a typical chased Dutch small village scene. 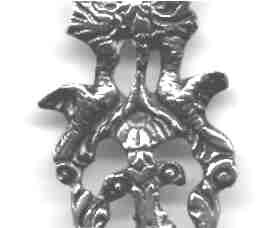 Within the pierced designs two more birds are also shown. The lip around the bowl (see first picture) is also hand chased.